Have you ever met an animal with opposable thumbs? Say hello to our nocturnal, ringed tail friend, the raccoon. While raccoons can look harmless, it is best to stay away. No one should ever want a raccoon in or around their property. In fact, we encourage anyone who is susceptible to having raccoons in their area to utilize our raccoon prevention services. At Minnesota Wild Animal Management, we understand the frustrations of having a raccoon on your property. Therefore, we want to prevent it for you altogether! For most people, it all goes back to the opposable thumbs and temperamental personalities. 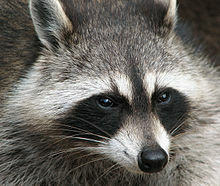 If you leave a loose canister or broken lid, you can expect that a raccoon will have the ability to open it themselves. 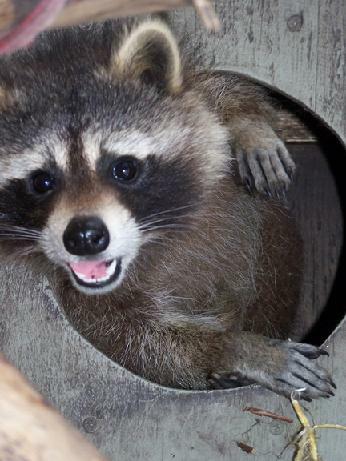 Raccoons tend to seek out homes and properties that have easy to access food and garbage. They will knock over garbage cans, make homes in your chimneys and attics, nest under your home and decks, and absolutely destroy your gardens. Once these animals infest your property, their ability to hide in tight and precarious places makes them extremely difficult to remove. There is no doubt that raccoons are a real nuisance to have on your property. They should be avoided at all costs, which is where our prevention techniques come into play. Oh and did we mention the health impacts? Raccoons have been known to have feces that can carry parasites. These parasites can be transferred over to both humans and your pets. Imagine waking up one morning, heading downstairs, and stepping in a nice pile of parasite-infested feces. Great way to start the day! Additionally and more seriously, raccoons are known to carry rabies. Rabies is a deadly and dangerous virus that should be avoided by all humans and pets. Being exposed to rabies can mean risking serious illness to your loved ones. Is that a risk anyone is really willing to take? This is why raccoon prevention is so vital. The peace of mind alone is worth every penny. Once we have thoroughly inspected and reinforced your home, our experts will feel confident in telling you that we have done all we can to aid in raccoon prevention for your property. Prevention services can make an enormous difference to your finances, your health, your safety, and your overall quality of life. This is why we feel it’s important to offer a four year warranty on all of our prevention services. We know that our raccoon prevention experts are the best at what they do and having a strong warranty to back our services gives all of our customers that same reassurance. So, if you’ve had a raccoon problem before or have been told that your property may be vulnerable to becoming a home to this nocturnal pest, consider learning more about raccoon removal & prevention services as well as the steps that we take to prevent them from invading your property. For more information about the prevention of raccoons and Minnesota Wild Animal Management, give us a call today at (612) 237-8282.